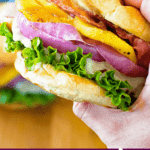 Delicious Grilled Chicken Breast that is marinated in a Teriyaki marinade then topped with grilled pineapple, red onion, cheese and a toasted bun. 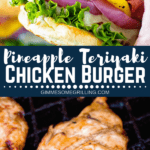 This Grilled Pineapple Teriyaki Chicken Burger will be your new favorite burger! Imagine a juicy chicken breast marinated in teriyaki sauce topped with melted cheese then piled on top of a crispy, grilled bun. 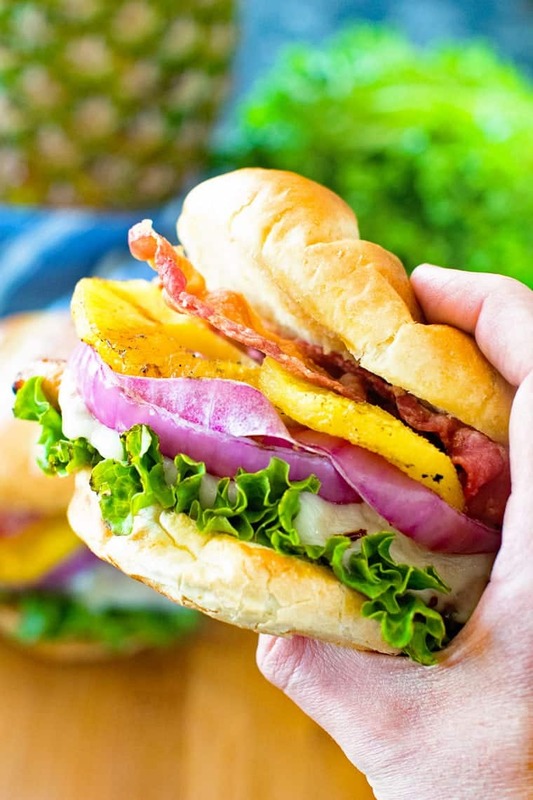 The bun has lettuce, grilled pineapple and onions plus bacon. Drooling much yet? You just got introduced to this Grilled Pineapple Teriyaki Chicken Burger! One day at church one of my friends was telling me about this Teriyaki Chicken Burger I just had to make. As she was describing how she made it I was thinking, yes I do need to make this! Now, I had to text her and ask again what exactly she put on it, then take a few twist and turns, but I think I got the main concept of this delicious Grilled Pineapple Teriyaki Chicken Burger down! For the record, it was everything I had imagined it would be! I love that I can marinate the chicken during the day and then throw it on the grill when I get home. Then I put cheese on it and melt it a little. I just love cheese! Don’t forget that you grill the onion and pineapple, too. Yessss. Did I mention there’s BACON!!! Oh, and the grilled bun! I do this with all my burgers now because I can’t go back to eating a regular bun! Pile it all on top of that crispy, toasted bun and you have a teriyaki chicken burger you can’t say no too. First thing you want to do is grab a Ziploc bag and put the teriyaki sauce and chicken breasts in the bag to marinate. Squeeze as much air out of the bag as possible and seal. Place in the refrigerator at least 4 hours and up to 24 hours. When ready to grill remove chicken from bag and discard remaining marinade. Heat grill to medium high heat, about 400 degrees. Lightly oil the grill grates. Place rings of pineapple and red onion slices on grill until caramelized and tender, remove and place tinfoil over the top of them to keep warm. 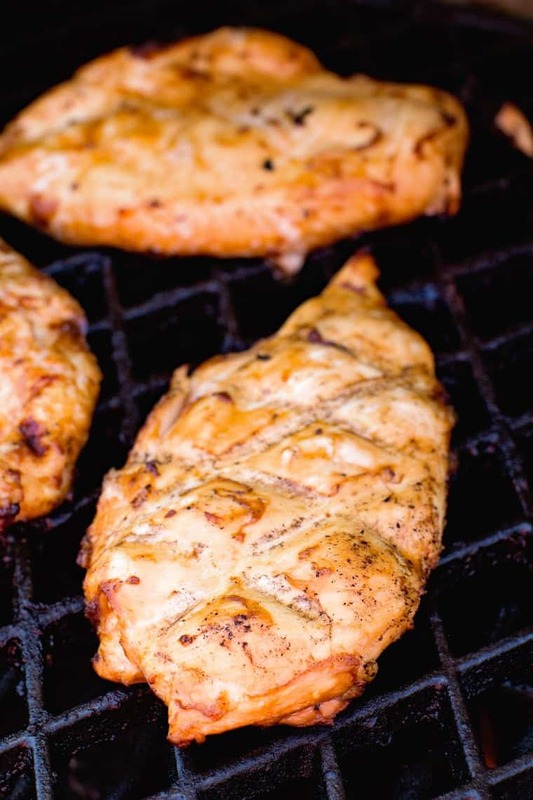 Place chicken on grill and grill for 4 minutes and flip and grill 4 more minutes or until the internal temperature is 165 degrees F. During last minute or two of grilling place slice of cheese on top of chicken to melt. Remove from grill. While chicken is grilling butter the insides of the buns and place the butter side down on grill until they are toasted. Remove from grill. You can grill the pineapple, onions, chicken and buns at the same time if you have a big enough grill. 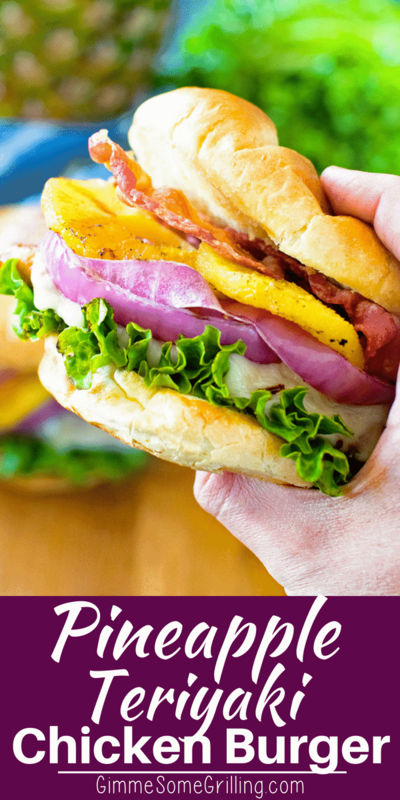 Assemble your burgers by place a leaf of lettuce on the bottom of your bun, then your chicken breast, red onion, pineapple and bacon. And for more burgers here are some favorites! Place chicken breasts and teriyaki sauce in Ziploc bag, squeezing as much air as possible out. Place in fridge, flipping if you can half way, for at least 4 hours and up to 24 hours. After it is done marinating remove chicken from bag and throw away marinade. Preheat the grill to medium high and lightly oil the grates. Grill the rings of pineapple and red onion slices until caramelized and tender, about 3 minutes per side for the pineapple and 4 minutes for the red onion. Remove ad cover with foil to keep warm. 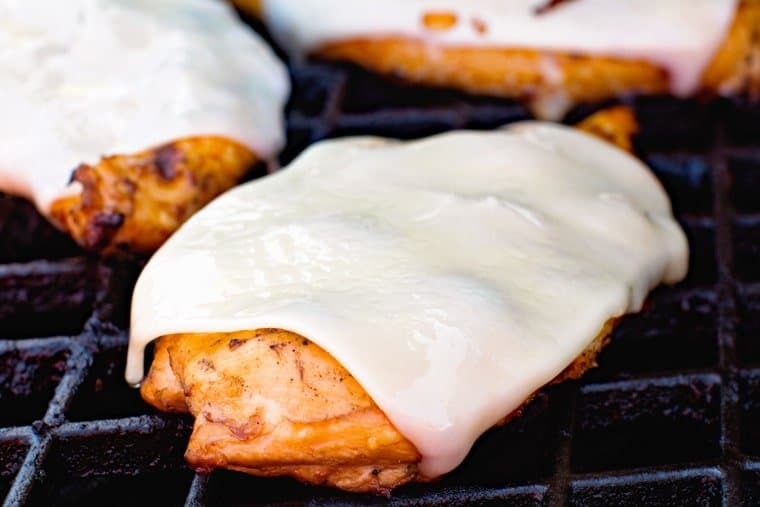 Grill the chicken breasts for 4 minutes on the first side, flip, and grill 4 minutes, or until internal temp reaches 165 degrees F. During the last few minutes of cooking place a slice of cheese on top of each chicken breast. While burgers are grilling butter inside of buns and place the buns, butter side down on grill. Grill until lightly toasted, remove from grill. 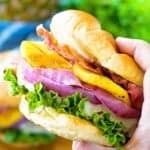 Top buns with leaf lettuce, chicken breast, red onion, pineapple ring and two slices of bacon then top with the top of the bun. Serve immediately. Recipe sounds delicious. I am going to have to get my hubby to fire up the grill. The only thing I saw wrong with this recipe is I think you meant to say “Squeeze as much air out of the bag” instead of marinade. Thank you for the great recipe!